The construction of the two story, 10,000 sf, Dignity Health Baseball Clubhouse is under way. Demolition of the old structure began in June and construction is estimated to be complete in April 2019. This project was made possible by the generous contributions of Cal Poly donors. New synthetic all-purpose field for Football practice and other activities. Renovation projects include FieldTurf Revolution turf, Beynon 2000 IAAF Certified track surface, and Daktronics 14’ x 25’ scoreboard. This project was made possible through the generous support of Cal Poly donors. Development of up to a 4500 kWAC Solar Facility on Gold Tree Road. The construction site location is two miles north on Highway 1 from the Highland Drive entrance to campus. This is a Single-Axis Tracking System with 16,397 modules, 75 DC:AC Invertors, a 15 kV transformer, site security fencing, and CEQA compliant landscaping screening. A separate educational Solar Lab, which will be built inside/outside Building 20 in the campus core, is a component that will help students learn about solar photovoltaic technology. The 18.5-acre solar farm will generate more than 11 million kWh per year — enough to power more than 1,000 homes, or about 25 percent of Cal Poly’s total needs — and includes more than 16,000 individual solar panels with a capacity of 4.5 megawatts (AC). Designed, constructed and maintained through partnership with San Luis Obispo based REC Solar (founded by Cal Poly graduates). Construction expected to start March 2019, and when completed will include a fully operational winery, meeting hall, and viticulture/enology/sensory labs. It will also be connected to a wastewater system capable of treating water for irrigation and sanitation uses. Currently under State Fire Marshall plan review. State Fire Marshall plan approval is anticipated by the end of January 2019. Project bidding and GMP negotiations currently underway. This project will update the design of the library with increased usable space that will better accommodate the changing needs of the campus community into the future. The updated layout will improve the university’s academic capacity and technology with new classrooms and study spaces. This renovation will improve the building’s mechanical systems and allow for more efficient building operations while improving comfort. A design objective is maximizing the use of the atrium and other spaces that are currently used as building support spaces. This project will maintain the special collections and general collections spaces to the maximum extent possible. The construction of the Oppenheimer Family Equine Center was completed on June 6, 2018 and consists of three new buildings. The 60,000 sf riding arena is mean to provide an all-weather practice riding area for CAFES Animal Science. The new Stallion Barn houses the University stallions used in breeding and research and the new Foaling Barn houses the foals and mares and is equipped with a camera system for monitoring the pregnancy and birthing. This proposed project includes new greenhouses/support facilities; a fruit and vegetable processing and research facility; a new plant sciences teaching and research laboratory building; a storage facility for restricted products and equipment; and a Farm Store. This design will replace a portion of the Crop Science Complex (Building 17) with new state of the art research, production greenhouses and associated support facilities. Onsite storage shed with full plumbing, electrical and data. WAP connectivity throughout the field. Project is currently in the programming and planning phase. This new facility at the center of campus, near the Baker Center, will bring three colleges together under one roof: the College of Science and Mathematics, the College of Agriculture, Food, and Environmental Sciences, and the College of Liberal Arts. The building will include large scale teaching spaces for use by the general university population. SATRC will support the educational priorities of a growing Cal Poly student and faculty population, promote interdisciplinary communities, and provide much needed research and academic space including student collaboration areas, faculty/staff offices, and shared conference/seminar rooms and a mix of large to medium size lecture and classroom spaces. The design plan features 4 stories and 102,000 GSF and an approximate project budget of 124 million, the majority of which is expected to be funded through private donations. This project is possible due to the generosity of Cal Poly donors. This plan seeks to improve the wayfinding experience for students, faculty, staff, and visitors around campus. The design of campus vehicle and pedestrian signage will be updated. Concepts are being developed for designing campus landmarks including entrance monuments. This project will renovate the University Union (Building 65), the Dining Complex (Building 19), and the University Union Plaza. A major focus of this project is transforming the existing buildings and spaces in this area into a cohesive “University Union Neighborhood”. This project seeks to create a diverse downtown atmosphere that allows opportunity for more student life programming and offers more amentiies on campus as student enrollment grows. Through this project, the Dining Complex’s mechanical systems will be upgraded, and the building’s layout will be redesigned to better accommodate a the changing trends in dining and culinary offerings. Improvements to the University Union include the redesign of student lounge spaces and a renovation of Chumash Auditorium in order to maximize the opportunities for student space throughout the buidling. This critically needed infrastructure maintenance project will replace all heating hot water pipelines within the “Utilidor” (underground utility corridor) with welded steel pipe, as well as replace all underground building hot water piping from the Utilidor, thus ensuring the integrity of heating hot water supply to the campus. Hot water supplied from the campus Central Plant provides the majority of the campus heating. At the end of the 2015-16 academic year, Cal Poly Corporation’s master plan for Campus Dining got underway with the closure of Vista Grande and development of a new state-of-the-art dining complex to replace the existing 43-year-old facility. Conceived to address the growing needs of the campus for on-trend dining options, this complex was planned based on research and analysis of the latest culinary concepts and campus community input. The new three-story dining complex will feature six micro-restaurants with exhibition-style cooking along with increased seating and lounge space. All of this will be encompassed in a modern building that boasts LEED certification for sustainable, resource-efficient design. With an expected completion time of just over two years and a cost of approximately $36 million, Campus Dining plans to open the new Vista Grande Dining Complex in fall of 2019. Live video feed is available on YouTube. 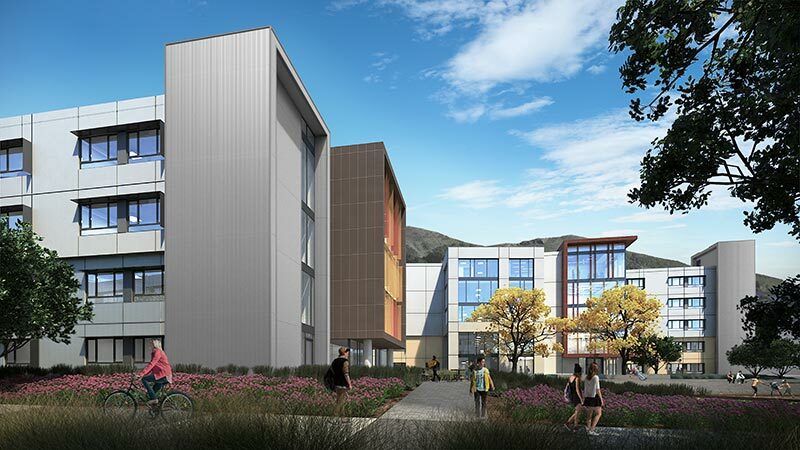 Cal Poly yakɁitʸutʸu Residential Community project is a dormitory style student community located at the corner of Slack Street and Grand Avenue. 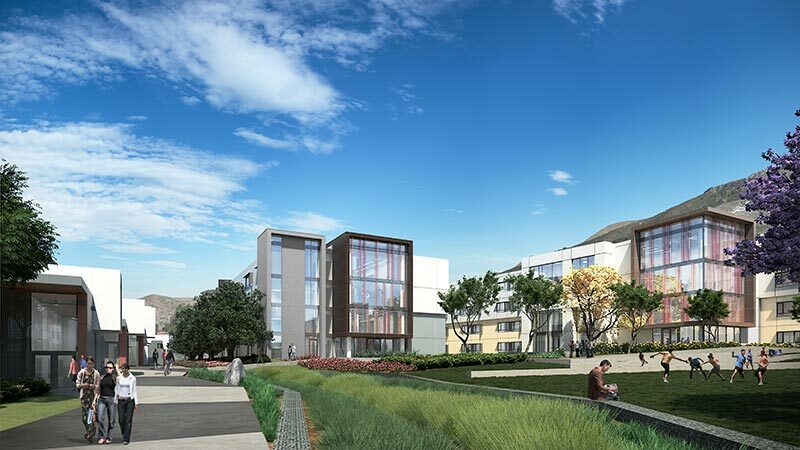 The project will consist of seven 3- to 5-story concrete framed freshman residence hall buildings with 1,475 beds and an adjacent four-level parking structure. Additional community space for the housing complex and the campus will wrap the parking structure on three sides. These spaces will include a small café, community room, game room, mail room, welcome center, offices, and maintenance shop. Site improvements will include a large open space in the center of the project for activities and group events, volleyball and basketball courts, and outdoor gathering spaces at each building. Webcor Builders and Valerio Dewalt Train Associates is the Design Build Team. Projected construction completion is Summer 2018.